BOCA RATON, Fla. and TEMECULA, Calif., Feb. 12, 2019 /PRNewswire/ -- *Wine and Art have outperformed stocks and bonds this year, so if you are looking for the finer things in life, here is a good place to start. As in being an Artist, who paints on canvas, there is an Art to making good wine, which is why the two worlds collide so gracefully, and how Stanton Barrett of Barrett Family Wines and Renée Guercia, Artist have merged their brands. 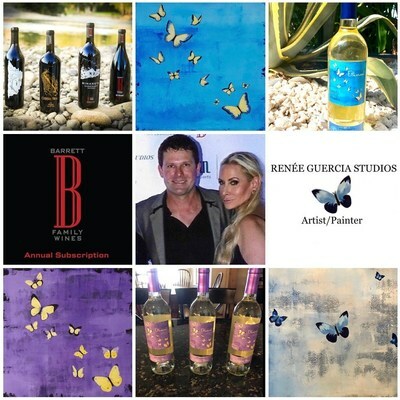 Stanton Barrett Wine Proprietor, along with Renée Guercia Artist, have joined both these worlds to create an outstanding wine with incredibly beautiful labels, from Guercia's Butterfly Series. Renée Guercia, an artist who is presently sold worldwide, is in Galleries in the US, and will be exhibiting in Europe in 2019, is presently selling pieces from her Butterfly Series at a discounted price to make room for her 2019 series.